SHOCKTOBER 2015 continues with movie #16, Attack the Block. I can barely believe that I'm keeping up not only watching movies, but also writing about them. I am a bit behind now on the writing, of course, but not obscenely so. I'm up to film #19, having missed only one day so far. I'm hoping to be able to make up for that lost film this weekend, and thereby get my days and films back in sync, but honestly this plan might be a bit too ambitious. 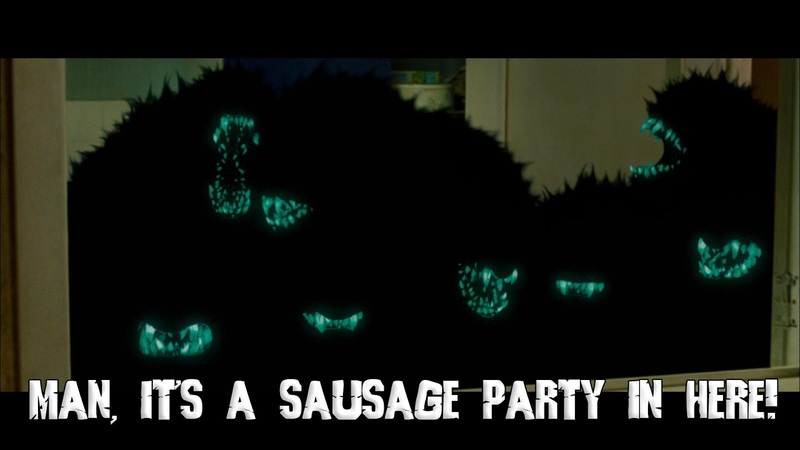 Anyway, Attack the Block is a solid, fun alien invasion flick with some original creature designs. The characters are a bunch of South London street thugs, all about 15 years old, and are initially demonstrated to be completely unlikable. In the opening moments of the film, the little rascals mug a perfectly nice woman, a nurse possibly on her was home from work. The movie is trying to reinforce that these hoodlums are not likable, which is potentially one of the biggest faults of the film. It is somewhat difficult to root for characters that are unlikable, but I will admit that at least here these feeling play into the arc of redemption that the lead character, Moses, goes through during the course of the film. The aforementioned mugging is interrupted by something falling out the sky, smashing a car parked on the side of the street. The hoodlums investigate and are attacked by a relatively small creature covered in whitish fur. They realize that this is likely an alien and, just as an rational person might do upon establishing first contact with an extraterrestrial race, they stab it until it dies. They parade their trophy around town, and eventually decide to stash it in an apartment building safe house which is usually used as a drug distribution center. Again, these characters are not presented as likable. The situation escalates upon the arrival of more aliens, which fall out of the sky like meteorites. These creatures are different in appearance from the earlier alien; they are larger in size, like one of the bigger apes, and are covered in the blackest fur imaginable. Special effects are used imaginatively here, and CGI is used to make the fur appear as close to absolute, flat black as possible. The creatures also have one other major characteristic; their teeth glow a strange fluorescent blue-green. It's a pretty unique design, and although you might fault the creatures for lacking detail, you have never seen another monster like this on film before. At least, I hadn't. The film goes on to reveal to a pretty unique vision of these aliens' life cycle. They are presented as being spore-like, traveling through the cosmos and settling upon hospitable worlds. It is suggested that the smaller alien killed in the beginning of the film is a female, and the larger creatures the males. The males are attracted to the female across space due to a pheromone trail, which is also leading all of the male aliens to the apartment complex where the female's body is locked away. It's a back story that makes no sense if you think about it - creatures made of familiar, living tissues, as these aliens SEEM to be, can't survive the vacuum of space or the heat of entry through the atmosphere. But whatever; the actual biology of the creatures is presented by a stoner dude that happened to catch a documentary on the National Geographic Channel, so I guess the source of the info is unreliable anyways. Still, its the only explanation offered by the film, so you sort of have to presume it is true by default - much like the much maligned comet explanation for the zombies in the original Night of the Living Dead. 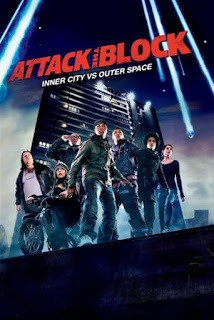 Attack the Block is a fun alien romp, and an effective redemptive arc is demonstrated by the unlikable protagonists. Combined with the cool alien designs, this is a Sci-fi film that I can pretty easily recommend. Although, some of the London slang dialogue can be hard to parse from time to time. Three out of four Bruces.